For many people, memorabilia is simply a case of going to a concert and buying the t-shirt, but it covers a much wider range than that! In the truest sense, the definition of memorabilia is "any objects kept or collected because of an association with a memorable person or event," so aren't all antiques memorabilia of some sort? 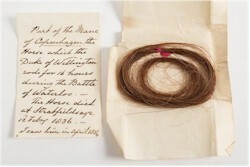 A lock of hair from the mane of Copenhagen, the horse ridden by Wellington at Waterloo, with a contemporary provenance in the hand of Lord Fortescue of Castle Hill (BK14/149). Copenhagen carried the Duke of Wellington for 17 hours continuously and was uninjured during the battle. He was retired to the Duke's estate at Stratfield Saye House. A marbled headstone marks his grave. Well yes they are, but in terms of auctions and collectors there are distinct recognised fields. The first of these is perhaps Rock & Pop memorabilia which has the strongest personal links for many collectors. Those who were lucky enough to see the Beatles, Rolling Stones or other classic artists may have obtained autographs or first issue copies of albums that had a significant cultural impact on a generation. Pristine records and signatures with good provenance, even sections of guitars smashed by Jimi Hendrix, are fetching several thousand at auction, even into the millions if once the personal property of any of the FAB Four. 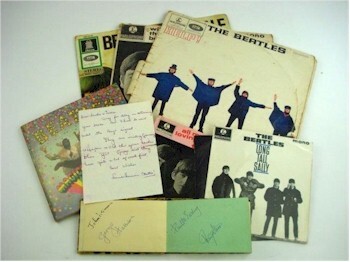 A Beatles autograph album signed by John Lennon, George Harrison, Paul McCartney and Ringo Starr together with a letter from Louise Harrison (SC19/1286). The same is true of many sporting events and notable sportsmen and women. While there are enthusiasts for all sports, the main area for collectors is football or motor racing. Once again, signatures of famous drivers, photographs of early races and programmes are eagerly sought after by dealers and collectors from the 'Golden age of motorsport'. 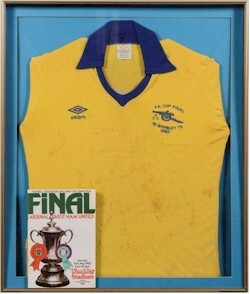 A 1980 Arsenal FA Cup Final signed away shirt (SC21/472). Collectors of football memorabilia also collect signatures and programmes of their favourite teams or players. One word of warning though. Even though footballers may have had a well-documented career on the field, they are often around a long time after the event still signing autographs, increasing the number available and, therefore, reducing the overall market value. Consider Geoff Hurst and Stirling Moss who both finished their careers in the 1960s. 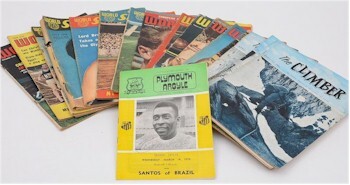 A Plymouth Argyle/Santos programme from 1973, signed by Pele and a group of 1950s and 1960s World Sports and The Climber magazines (SC20/645). .
Royalty is another area that many people recognise under the umbrella of memorabilia. Each event is an historic occasion and many items are produced that can fall under the scope of other fields in the auction world. Ceramics, glass, silver, stamps and even pieces of wedding cake commemorating a royal event have all been in an auction at Bearnes Hampton & Littlewood at some point. A framed single sheet film poster for 'Fangio' by AG & Associates. 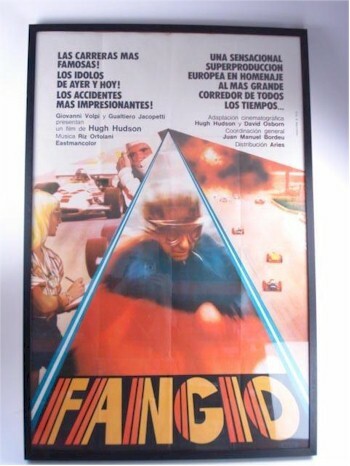 The 1980 film, directed by Hugh Hudson, chronicled Fangio's life with his own testimony (SC20/641). Today one of the growing areas of memorabilia is film and television, which has exploded thanks to one particular film from 1977: 'Star Wars'. Changing the way that films are promoted and the spin off toys and collectables that are produced after a film is released has turned into a multimillion industry for both the toy makers and film makers equally. So much has this happened that films have actually been put together about specific products in order to generate more sales demand. While there is obviously a huge range that can be covered, the more significant the event or the person involved or the impact on the culture of a generation, the greater the overall value will be at auction. Nelson and Bonaparte along with Wellington are perhaps the leaders of the market in the terms of historical figures and events but overall 'each to their own' would seem to cover the tastes of all collectors under the definition of memorabilia.